Offering a seasonal outdoor swimming pool and a fitness centre, that is complemented with barbecue facilities, Majestic Sun Beach Resort by Panhandle Getaways is set in Destin, 6 km from SunQuest Cruises. The property is 8 km from Emerald Coast Centre and 9 km from Beaches of South Walton. The apartment is composed of a living room with dining area, a fully equipped kitchen and 2 bathrooms. A flat-screen TV with cable channels is offered. The apartment offers a range of wellness facilities including a hot tub and an indoor pool. Guests can also relax on the sun terrace. Big Kahunas is 11 km from Majestic Sun Beach Resort, while Destin History and Fishing Museum is 15 km away. 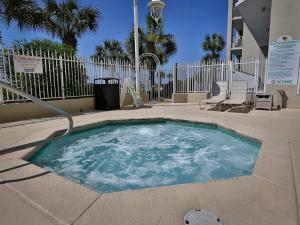 The nearest airport is Destin-Fort Walton Beach Airport, 45 km from the property. When would you like to stay at Majestic Sun Beach Resort by Panhandle Getaways ? Each day we'll check prices and send you an email for your selected dates at Majestic Sun Beach Resort by Panhandle Getaways. If you don't have specific dates but would like to check prices for say next weekend or say next month we can check the price too. Click to write a review and share your experience of Majestic Sun Beach Resort by Panhandle Getaways with other travellers.